Countless pundits owe a substantial portion of their living to pushing the unsubstantiated trope of “Division Among Democrats.” The meme is so famous it even has a hashtag, #DemsInDisarray. Supposedly, deep and intractable ideological divisions exist within the Democratic base and the resulting conflict will prevent Democrats from governing or even winning elections in the first place. This cynical narrative has become a part of the conventional wisdom but there isn’t much empirical evidence to support it. We find that different demographic groups within the Democratic party have different priorities, as one might expect of any big tent party (we’ll dedicate a full post to diving into this soon). However, there is not much evidence that Democrats are divided by ideology or factions devoted to Hillary Clinton or Bernie Sanders. In addition to demographics, we’ll show that level of political engagement gives us a much more useful way to think about the groups that make up the Democratic base. Activist Democrats as well as disengaged non voters and infrequent voters each report distinct priorities and will play different roles in future Democratic success (or failure). Data for Progress and YouGov Blue polled a nationally representative sample of Democrats and asked them to allocate 100 points to a selection of policies according to their priorities. We also asked several questions about how respondents self identify ideologically. You can find our initial analysis of this data here and here. While these categories are not mutually exclusive, 61 percent of Democrats consider themselves progressives, 27 percent identify as socialists, and 28 percent identify as ideologically moderate. The breakdown of federal priorities for these groups don’t show differences that are particularly compelling. Healthcare is the top issue for each group. Moderates place less emphasis on Medicare for All but prioritize cheaper prescriptions more than all Democrats (moderates tend to skew a bit older). Moderates and socialists both place immigration as a top issue, with moderates placing more emphasis on immigration reform and socialists tending to favor abolition of ICE slightly more than average. However, these differences are fairly minor and certainly do not suggest deep ideological divides among the Democratic base. We see even less of a difference between these groups when we asked respondents to rate their state level priorities. We can see some differences by ideology when we asked respondents to allocate points to various reasons to primary a Democratic incumbent. Progressives and socialists seem more interested in primarying incumbents who hold conservative policy positions or vote with Republicans too often. On the other hand, moderates tend to think that poor constituent services are a better reason to primary an incumbent. These results echo an earlier analysis from Kevin Reuning which took a different approach to the same dataset. Reuning categorized Democrats as insiders if they had a more favorable view of the Democratic National Committee (DNC) than the Democratic Socialists of America (DSA) and outsiders if they if they viewed the DSA more favorably that the DNC. Insiders and outsiders did not differ very much on policy but outsiders tended to be younger and more engaged in activism. While the 2016 primary continues to be rehashed on social media on a daily basis there is not much difference in policy priorities between Hillary Clinton supporters and Bernie Sanders supporters. About 29 percent of Democrats rated their favorability of Hillary Clinton at 90/100 or higher, 34 percent rated Bernie Sanders 90/100 or higher, and 11 percent rated both Clinton and Sanders at or above 90/100. Democrats with a highly favorable view of Sanders placed higher priority on Medicare for all while Democrats with a highly favorable view of Clinton placed impeachment a bit higher but the nothing would indicate intractable policy divisions between the two camps. 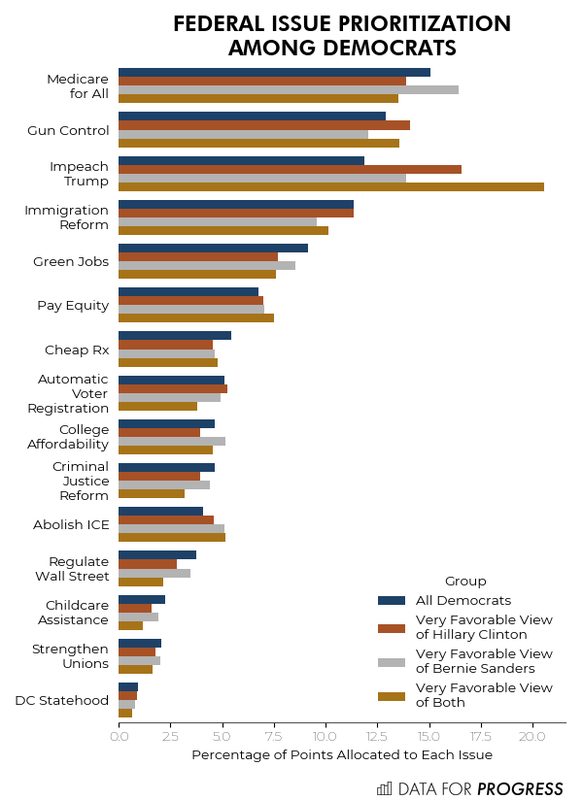 Democrats with highly favorable views of both Clinton and Sanders strongly prioritize impeachment but this doesn’t seem to have much of anything to do with Clinton or Sanders per se. Instead, this group appears to be strongly partisan, viewing most Democrats and Democratic figures favorably and holding particularly negative views of Trump. The Democratic party is a coalition of a number of different demographic groups who have different material interests and therefore different policy priorities. This is a characteristic feature of the party which we do not want to gloss over. Instead, we emphasize that despite an endless number of contrived hot takes about ideological divisions within the Democratic party, ideology does not appear to tell us much about which policies Democrats prioritize. In fact, just about anything seems to be more relevant than ideology as an indicator of priorities. For example, people who did not vote in the 2016 election as well as Democrats who are highly engaged in activism each have distinct priorities. Activist Democrats are relatively more interested in Medicare for all, automatic voter registration, and financial regulations while 2016 nonvoters placed higher than average priority on green jobs and impeachment. At the state level, 2016 nonvoters placed higher than average priority on tuition free community college and family and medical leave but were much less interested in automatic voter registration, repealing abortion restrictions, and repealing anti-union laws than activist Democrats were. Grouping Democrats by their level of political activity gives us a much more useful and interesting framework to understand the dynamics of the Democratic party than ideology does. For example, there is probably not much hope of a progressive Democratic party without engaging nonvoters and converting Democratic-leaning marginal voters to reliable voters. Future Democratic electoral success may hinge upon whether or not these people can be mobilized. The priorities of activists and other highly engaged Democrats may give us some insights into the next generation of Democratic candidates. Notably, young candidates cited concerns about local issue far more often than they cited Trump as a reason for why they ran for office. While pundits are sure to keep publishing takes on ideologically divided Democrats, keep in mind that there is a much smarter way to think about the different parts of the Democratic base.